Dual Port AES50 Repeater with up to 100 Metre Range - Extends two independent AES50 connections by up to 100 m with CAT5 cable - High channel capacity - 48 channels @ 96 kHz or 96 channels @ 48 kHz bidirectional operation - Supports dual-redundant AES50 networks (X and Y connections) - Rugged locking Neutrik* etherCON connectors used for AES50 connections - Status indicator LEDs on front panel for each AES50 port - Dual-redundant power supply inputs with locking Switchcraft* connectors - Aluminium extrusion casing with stackable protective silicone rubber sleeve - Compact and rugged design - 3-Year Warranty Program** - Designed and engineered in England The KLARK TEKNIK DN9610 is a cost-effective solution for extending AES50 multichannel digital audio network connections (Cat-5E/Cat-6 cabling) to greater distances than previously achievable. Housed in a rugged, compact, alloy case, and enclosed in a shock-absorbing silicone sleeve, the DN9610 will fit almost anywhere, being no larger than many D.I boxes! Each DN9610 is capable of extending two AES50 streams by up to 100m (330ft). Provision is made for dual redundant power supplies, with automatic, seamless recovery in the unlikely event of a power supply failure. Power supplies are multi-region and feature locking DC connectors to ensure against inadvertent disconnection. The DN9610 is capable of both 24-bit 48 kHz and 24-bit 96 kHz operation, and can operate it’s two AES50 streams at different clock rates simultaneously! Through-unit latency is an astounding 0.03ms. Multiple DN9610’s can be connected in series, allowing transmission of AES50 over considerable distances. Discrete LED status indicators are provided for power, AES50 input 1, AES50 input 2, AES50 output 1, and AES50 output 2. The four RJ-45 sockets are roadworthy Neutrik EtherCON connectors. 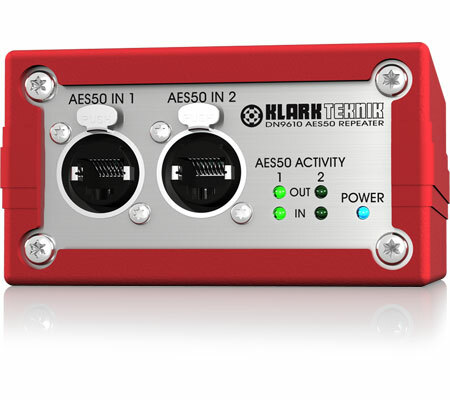 The DN9610 operates with ANY AES50-compliant devices. You Are Covered We always strive to provide the best possible Customer Experience. Our products are made in our own MUSIC Group factory using state-of-the-art automation, enhanced production workflows and quality assurance labs with the most sophisticated test equipment available in the world. As a result, we have one of the lowest product failure rates in the industry, and we confidently back it up with a generous 3-Year Warranty program.